PRESS RELEASE: Sound Gallery Studios have successfully established Analogue To Digital as an annual event that has put Exeter on the map as a leading host for music technology and innovation in the South West. 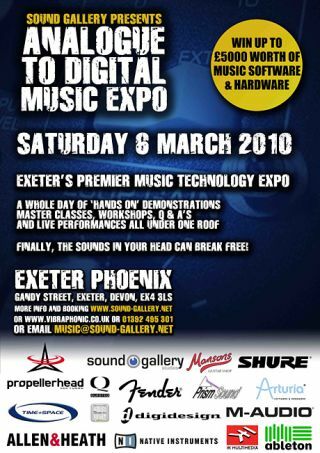 So Analogue To Digital 2010… bigger, better and with even more music, instruments and the latest stuff for you to come and play with! This event gives the opportunity to everyone involved in music-making to come and try out all the latest music technology in the way it was designed to be used, with hands-on demonstrations, master-classes, workshops, Q&As and live performances all under one roof. A To D has something for everyone and for all ages. Whether you are just starting on your musical journey, learning an instrument, a seasoned pro, DJ, sound engineer or performing artist, Analogue To Digital will have something for you. Build a spring reverb workshop: Learn how to build a classic spring reverb during this hands on workshop. Traditionally used on recordings from pop to dub and everything in between! Acoustic treatment and sound proofing workshop: Learn some of the secrets of the pros on how to make a better environment for your home recordings and avoid falling out with your neighbours.